Kathleen Brown (left) helps coordinate Week of Welcome to engage incoming students, and initiate a sense of belonging. Nov. 30, 2018 LA GRANDE, Ore. – A series of semi-invisible structures support struggling students at Eastern Oregon University. Kathleen Brown, who coordinates the many interlocking resources that fall under student success, said some of the students she’s monitored are unaware of the intricate network of advisors, tutors, professors and specialists who’ve supported their progress. Brown’s carefully calibrated model contributes to the increased retention EOU saw in fall 2018. Enrollment reports show that retention from junior to senior status was 7 percentage points higher than last year. This particular cohort is the same one that recorded a very high 72 percent retention rate from its freshman to sophomore year. Kevin Jamieson, an online student majoring in Fire Service Administration, lives in Eagle River, Alaska and is determined to complete his degree. Jamieson said his advisor, Dan O’Grady, has been a key part of his success at EOU. Jamieson started his degree back in 2009 at Western Oregon University, and transferred to EOU about a year ago. He’s on track to graduate this spring. A shift in credit hours suggests that online students in particular elected to take fuller course loads than they did in fall 2017. EOU also saw an uptick in new transfer students, both online and on campus. EOU saw about a 5 percent increase in on-campus attendance, but remained nearly flat for overall enrollment. The Strategic Enrollment Management Team (SEMT) was created last winter to address flat enrollments, and the campus-wide efforts are beginning to gain momentum. Karpilo oversees the team’s activities and reports its progress to the Board of Trustees each quarter. Recruiting, retaining and graduating students remains the primary focus of every faculty, staff and administrator at the university, Karpilo said. 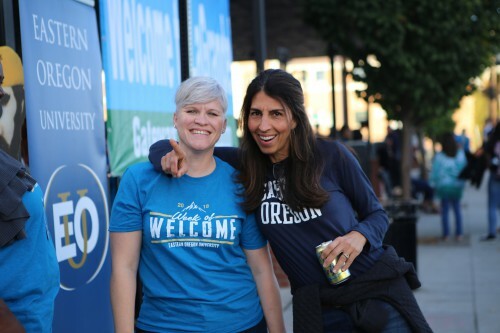 The Board of Trustees still aims to reach its goal of 5,000 full-time-equivalent students online and 2,500 on campus by EOU’s centennial in 2029. Brown is looking to expand the system of resources to include Mountaineer Success Coaches starting next term. EOU staff and faculty have volunteered to serve as informal mentors to students of promise, who have struggled academically. Brown said the relationships she builds with students are at the center of her work, and seeing them succeed and graduate keeps her committed to incorporating new ideas and resources.